Recall from that one of the chnrnctcristi.cs of an ideal operational amplifier is that It has zero output voltage when both inputs are 0 V (grounded), This chaructoristic is p~rHc~larly importa~t in appllcations .where de or 19 w-frequency signals arc . If the output IS not 0 :when ~he inputs . then the output will not he lit Its correct de level when the Input IS n de level other than O. The actual value of the output voltage when the: inputi tire 0 is called the output off.·,( cottage. 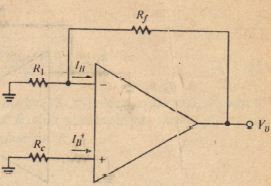 Output offset is very much like a de bins level in the output of a converuioual amplifier in that it is added to whatever signal variation occurs there, If an operation1 amplifier ·is used only for ac signals, it can be capacitor-coupled if necessary or desirable to block the de component re~~osentQd by the;’ offset. However, the capacitors may have to be large if low frequencies and small impedance levels are Involved. Alse, 0 de path must always be present between each input and ground to allow bias currents to flow. Small offsets, on the order of a few millivolts, CUll oftlJll be ignored if the signal variations are large by cornparison. 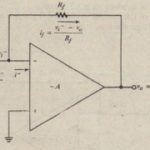 On the other hand, a frequent application of operational amplifiers is in precise, high-accuracy signal processing at low levels and low frequencies, and in these situations, very small offsets are crucial. Manufacturers do not generally specify output offset because, as we shall see, the Of(lit;t level depends on the closed-loop gain that a user designs through choice of external Ctlmpm/!nt values. Instead, input offsets are specified, and the designer can use these values to eompute the output offset that results in a particular application, Output offset voltages are the result of two distinct input phen rnena: input bias currents and input offset voltage. We will use the supcrpositioi principle to the contribution of each of these input effects to the output offset voltage. In our discussion of differential amplifier circuits in Chapter 12, we ignored base currents because they hod negligible effects on the kinds of computations that held our interest then, We know that some dc base current must flow when a transistor is properly biased, and, although small, this current flowing through the external resistors in an amplifier circuit produces a de input voltage that in turn creates an output offset. To reduce the effect of bias currents, a compensating resistor R, is connected in series with the noninverting (+) terminal of the amplifier. 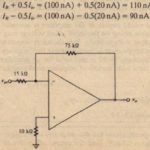 (K must provide a dc path to ground, so if a signal is capacitor-coupled to the + input, R; must be connected between the + input and ground.) 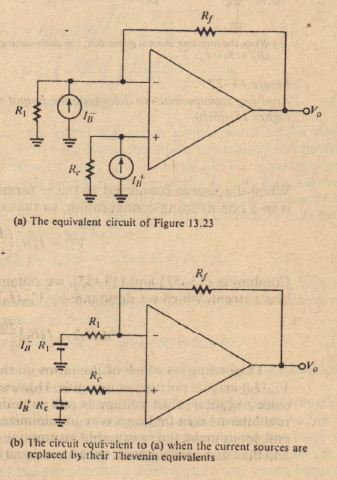 We will presently show that proper choice of the value of R, will minimize the output offset voltage due to bias current, Figure 13-25 shows the bias currents It and I/j flowing into the + and – terminals of an operational amplifier when the signal inputs are grounded. While the bias currents may actually flow into or out of the terminals, depending on the type of input circuitry, we will, for the sake of convenience, assume that the directions are is shown and that the values are always positive. These assumptions will not affect our ultimate conclusions. 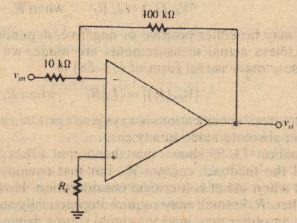 The figure also shows the compensating resistor R•.connected in series with the + terminal. Note that this circuit applies to both the inverting and noninverting configurations. 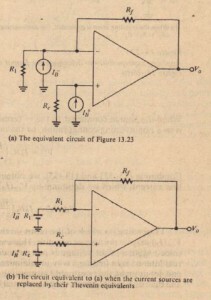 Using Figure 13-26(b), we can apply the superposition principle to’ determine the output offset voltage due to each input source acting alone. As illustrated in Figure 13-27(a), the amplifier acts as an inverter when the source connected to the + terminal is shorted to ground, so the output due. When the source connected to the terminal is shorted to ground, the amplifier is in a noninverting configuration, so the output due to lyRc. Depending on which of the terms on the left side of equation U-S4 is greater, VO.l'(IIi) may be positive or negative, However, the sign of VoS(ln) is of little interest, since negative offset voltage is just as undesirable as positive offset voltage, Our real interest is in finding a way to minimize the magnitude of VO.l'(/II)’ Toward that end, let us make the reasonable assumption that the two inputs arc closely matched and that, as a consequence, they have equal bias currents: It = [/j = [/In’ Substituting. Equation 13-57 shows that the offset voltage is proportional to the difference between IJi and In when R R, II Rf. Since the inputs are usually reasonably well matched, the difference’ etween Ik and In is quite small. The equation confirms the fact that Vos is 0 if IJi exactly equals Is. The quantity IJi – Iii is caIled the input offset current and is often quoted in manufacturers’ specifications. Remember that it is actually a difference current. Letting the input offset current n – to be designated by Ii,,, we have, from equation 13-57. Manufacturers’ specifications always give a positive value for Ii”, so it is best interpreted as an absolute value in any case. . Equation 13-59 shows that the output offset is directly proportional to the value of the feedback resistor Rf• For that reason, small resistance values should be used when offset is a critical consideration. 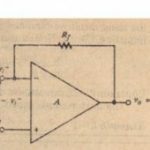 However, to achieve large voltage gains when Rf is smaIl may require impractically smaIl values of R to the extent that the amplifier may load the signal source driving it. 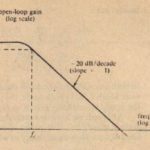 In any event, large closed loop gains are detrimental to another aspect of output offset, as WI. : will see in a fort hcorning discussion. If 1/1 > n, the + and – signs between terms in (13-61) are interchanged. Proof of these relations is left to Exercise 13-44 at the end of the chapter. bias current is HO nA and that the input offset current is 20 nA. 1. Find the optimum value for R,. 2. Find the magnitude of the output offset voltage due to bias currents when R.. equals its optimum value. 3. Assuming that n > 1/1, find the magnitude of the output offset voltage when R, = O. 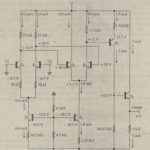 The specifications for the amplifier in Example 13-14 state that the input offset voltage is 0.8 mV. Find the output offset due to this input offset.